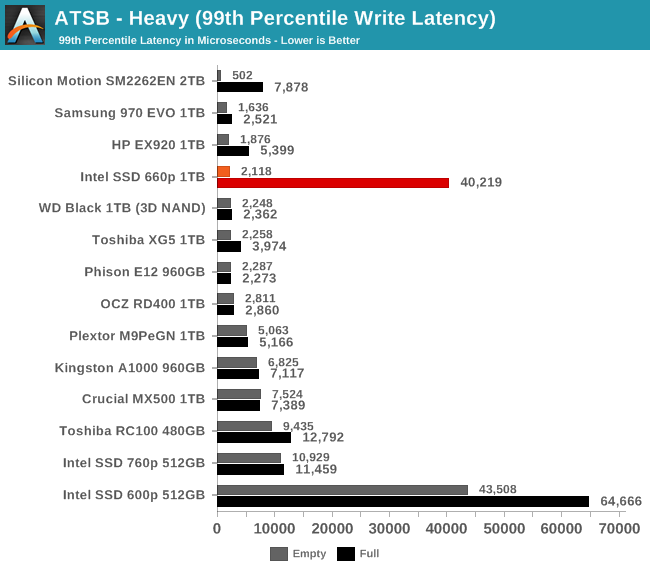 When the Heavy test is run on an empty Intel SSD 660p, the test is able to operate almost entirely within the large SLC cache and the average data rate is competitive with many high-end NVMe SSDs. When the drive is full and the SLC cache is small, the low performance of the QLC NAND shows through with an average data rate that is slower than the 600p or Crucial MX500, but still far faster than a mechanical hard drive. 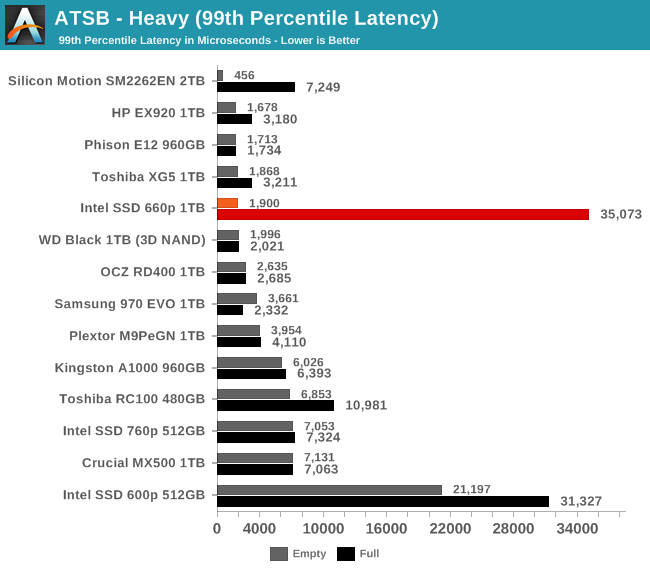 The average and 99th percentile latency scores of the 660p on the empty-drive test run are clearly high-end; the use of a four-channel controller doesn't seem to be holding back the performance of the SLC cache. 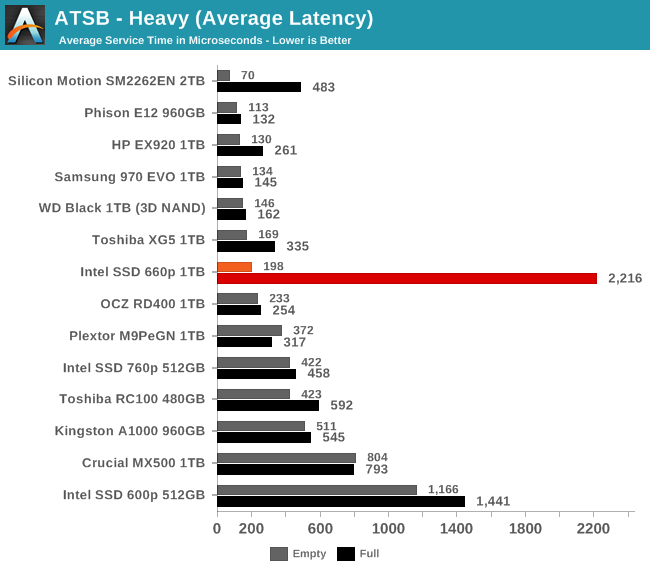 The full-drive latency scores are an order of magnitude higher and worse than other SSDs of comparable capacity, but not worse than some of the slowest low-capacity TLC drives we've tested. 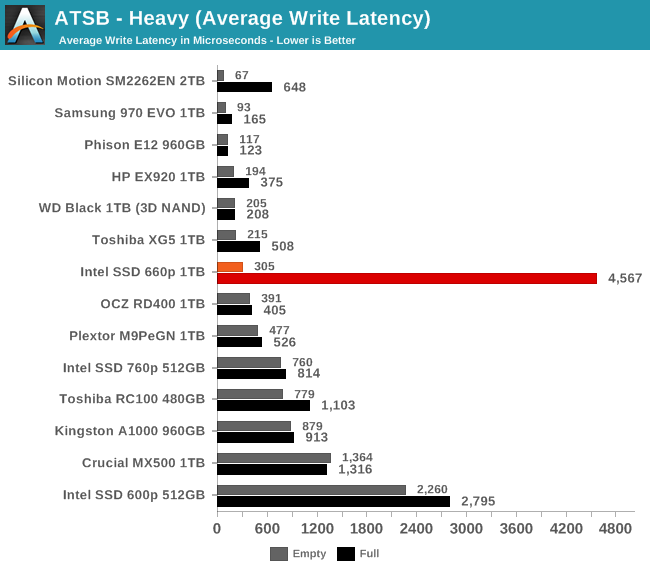 The average read latency of the Intel 660p on the Heavy test is about 2.5x higher for the full-drive test run than when the test is run on a freshly-erased drive. Neither score is unprecedented for a NVMe drive, and it's not quite the largest disparity we've seen between full and empty performance. The average write latency is where the 660p suffers most from being full, with latency that's about 60% higher than the already-slow 600p. 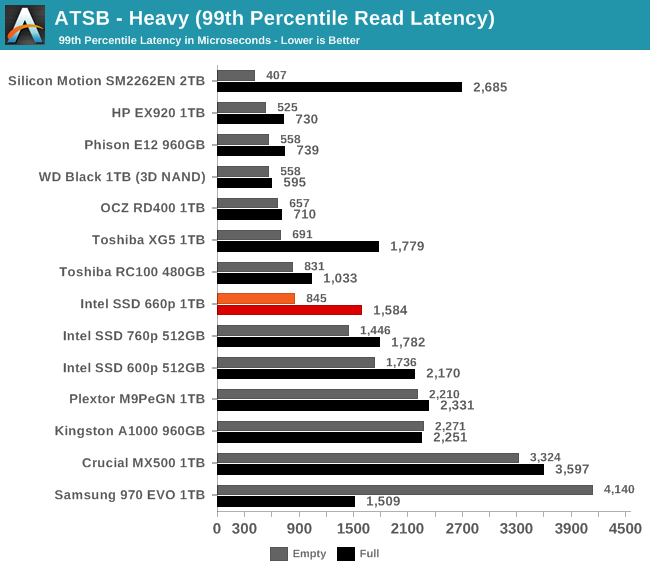 The 99th percentile read latency scores from the 660p are fine for a low-end NVMe drive, and close to high-end for the empty-drive test run that is mostly using the SLC cache. The 99th percentile write latency is similarly great when using the SLC cache, but almost 20 times worse when the drive is full. This is pretty bad in comparison to other current-generation NVMe drives or mainstream SATA drives, but is actually slightly better than the Intel 600p's best case for 99th percentile write latency. 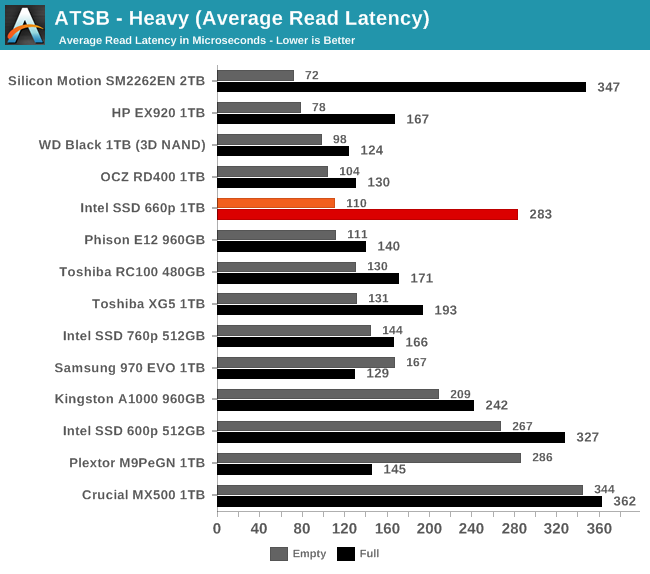 The Intel SSD 660p shows above average power efficiency on the Heavy test, by NVMe standards. Even the full-drive test run energy usage is lower than several high-end drives. 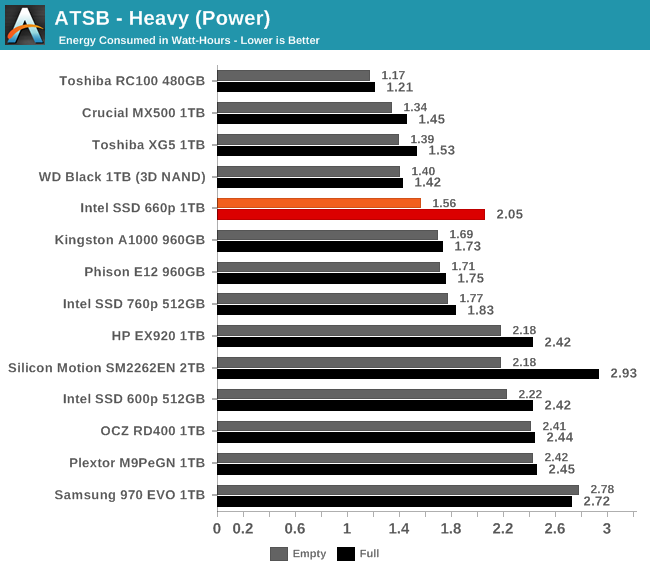 Interesting performance measurements. Variable size pseudo-SLC really helps to cover up the QLC performance penalties which look pretty scary when the drive is mostly full. 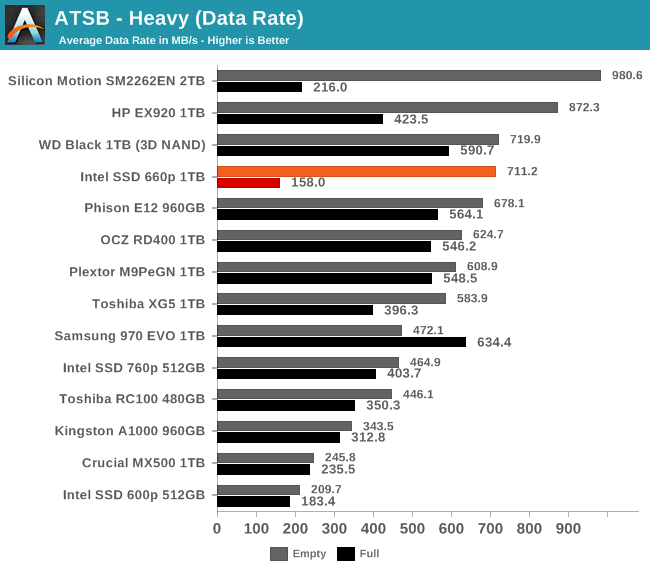 The .1 DWPD rating is bad, but typical consumers aren't likely to thrash a drive with that many writes on a daily basis though Anandtech's weighty benchmarks ate up 1% of the total rated endurance in what is a comparable blink of an eye in the overall life of a storage device. The 840's TLC degraded performance because of falling voltages, not because of anyone "thrashing" the drive. "few sites covered the standard 840"
storage temperature. In MLC and SLC, this can be as low as 3 months and best case can be more than 10 years. The retention is highly dependent on temperature and workload.